Historically, living in Rockridge, CA has always been one of the top places to call home in the Bay Area and consistently makes it on the top 10 lists. Today many who live there would still argue it is the best place to live. A combination of pleasant weather, atmospheric cafes and gourmet restaurants, antique shops and independent bookstores, and Craftsman bungalows dotted along leafy streets near good schools is what makes Rockridge a huge draw. With its easy access to BART and convenient location to major freeways, it makes for a pleasant day trip. The heart of Rockridge is College Avenue. Starting at Broadway, College Ave will actually take you all the way down to UC Berkeley. Passing through Oakland first and then Berkeley (Elmwood), College Ave is bustling with activity. 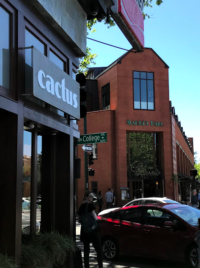 Right by the BART, you will find one of the best Taquerias in town – Cactus — make sure you try their Crispy Chicken Tacos – they are are sublime. Across the street from Cactus is Oliveto, an amazing upscale Italian cafe and restaurant = restaurant that is perfect for special occasions. In the same building, you will find Market Hall, a landmark European style market. With it’s cheese shop, butchershop, a fish shop (which will fry up fresh fish and make you the best fish sandwich in town any day of the week), a coffee shop, and bakery (if you like chocolate, try the Black Magic cake, yum! ), it is a favorite for locals coming off BARTand picking up dinner, groceries, flowers, etc. for the family before walking home. Also on College Ave, you will find an assortment of restaurants – everything from Sushi, to Thai, to award winning Vegan restaurant, Millennium, high-end clothing shops as well as super cool consignment shops, home goods stores (including Coles), furniture store, bookstores, etc. It is sooo easy to make a day of just walking up and down college, grabbing lunch, doing some shopping and enjoying the awesome vibe. The neighborhood elementary school is one of the best in Oakland – Chabot Elementary –It’s a neighborhood school like where the majority of kids walk to school. The PTA is a force to be reckoned with and provides the school and students with a multitude of enrichment activities (music program, computer lab, an amazing science and art program). For all these reasons and so many more, Rockridge is a favorite destination for SF dwellers looking for the right combination of urban and suburban – there is shopping and restaurants but also homes with backyards, and parking! Cactus Taqueria for amazing crispy chicken tacos, The Ramen Shop for the best ramen. Frog Park if you have little kids, Lake Temescal for picnics, playdates, walking the dog and even fishing.